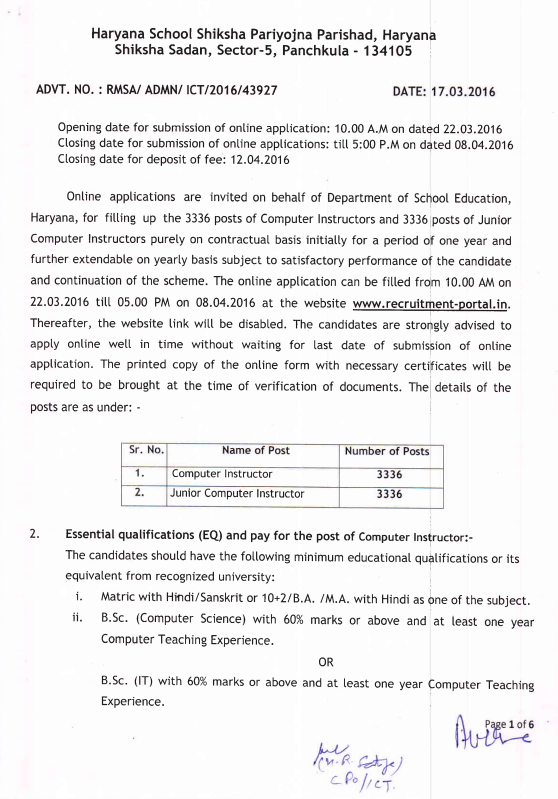 Eligibility-Matric with Hindi/Sanskrit or 10+2/B.A. /M.A. with Hindi as one of the subject. DOEACC O Level course or ITI in Electronics/ Computers/Electrical OR 10+2 with one year Diploma in Computer Software/Hardware. B.Sc. (Computer science) with 60% marks + One year Computer Teaching Experience OR B.Sc. (IT) with 60% marks + One year Computer Teaching Experience OR BCA with 60% marks + One year Computer Teaching Experience OR A' Level DOEACC accredited course with 60% marks + One year Computer Teaching Experience OR Graduation in any stream with 60% marks or above with APGDCA/ PGDCA and at least one year Computer Teaching Experience. Consolidated Salary-. 13350/- per month. Application fee-1000/- for General and BC category candidates.500/- fee for Femate/SC candidates of Haryana. Age as on last date of application-18 to 42 years.Relaxation as per Govt. of Haryana rules. Publisher of this Advertisement-State Project Director,Shiksha Sadan, 3rd Floor, Sec-5, Panchkula.